The Columbia Inn at Peralynna, A boutique hotel. Escape. Unwind. Relax. ATTENTION GUESTS: Our booking web link is temporarily under construction. Please call us directly to book your reservation, 410-715-4600. If you have any trouble making a reservation please call 410-715-4600 for immediate assistance and best rates! We are looking forward to assisting you. Nestled in a private estate and the rolling hills in Howard County, named by Forbes Magazine as "Top 25 Places to Live Well", The Columbia Inn at Peralynna is a boutique hotel unlike any other. Our inn features a unique blend of chic and elegant style, exceptional world-class amenities and gracious hospitality. Our critically acclaimed property has enjoyed outstanding reviews. We are honored to receive the Diamond Award and Sapphire Award for eight years in a row. The Columbia Inn has so much to offer for corporate travelers, intimate weddings, family, and our corporate and private retreats are top notch. The Columbia Inn at Peralynna stands as a local landmark and overlooks the gentle rolling hills of Clark’s Elioak Farm in Columbia, Maryland. From Family Friendly Economy to the Grand Spa Suites- rates range from $99-$450 and are subject to change without notice. Give the gift of luxury! Gift certificates are available for any amount and all certificates include a complimentary wine tasting and tour! 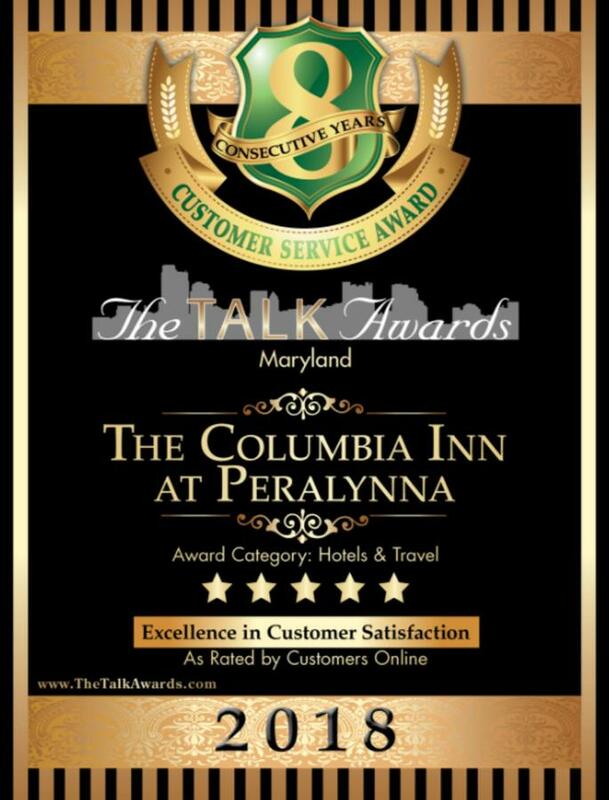 The Columbia Inn named "Baltimore's Best"
The Columbia Inn is honored to be named the best Inn in Columbia, MD by the travel editor of Baltimore Magazine! Our guests visit from all over the world, and we are pleased to be recognized by local readers and travel editors as the place to stay in Columbia. HGTV recently visited The Columbia Inn at Peralynna for their special edition of Dream Homes. The crew toured the inn with fresh baked brownie stuffed chocolate chip cookies in hand, learning about the history of the propert in the Lynn family, and the construction of the inn. Join us for a Dream Home celebration in June in our Grande Room for appetizers, music, and cheer! The Columbia Inn offers wedding packages starting at $1899 for initimate ensuite weddings. Contact Anne Kearney at (410) 715-4600 or email: columbiainnevents@aol.com to plan your elegant mansion wedding today! We are Columbia, Maryland's only "Green Hotel". We have made important environmental improvements to its structure in order to minimize its impact on the environment. We do not use neurotoxins on any part of our Inn like most hotels. We have set in place several practices that make it easy to play a role in being environmentally friendly. Email Dmcd4anth@aol.com for the perfect bed and breakfast in Chelsae, NY. Offering short and long term stays, competitive rates and great hosts! The Columbia Inn at Peralynna is pleased to announce that we are once again an Independent Boutique Hotel. We extend a huge thank you to our loyal customers, who have supported us on our 21 year journey, and our brief experimentation with being part of a larger brand. There are always pros and cons, but in the end our guests, staff and I felt that we could better serve our guests, who helped us to grow and who continue to share with us better ways to serve them, which we continue to incorporate in our services.